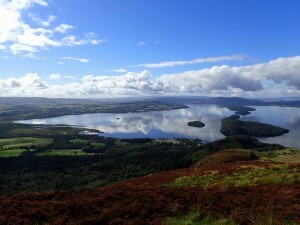 “I just wanted to say what an amazing time I had on my west highland way walk. Yes it was a challenge but I did it and it felt amazing. I wanted to mark the end of my treatment for breast cancer with something special and a challenge that would help me get some fitness, a sense of achievement and some of myself back after 17 months of cancer being my only thoughts and nightmares. 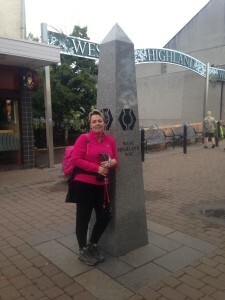 My challenge was to walk 47 miles of the west highland way from Milngavie to Crianlarich in 5 days and With the amazing help of CCTA it all became a possibility. It was now just up to me to put in the training and make sure I was ready. I may have doubted myself a few times but when the time came to start my adventure off I went to Milngavie where the start of the west highland way is marked. 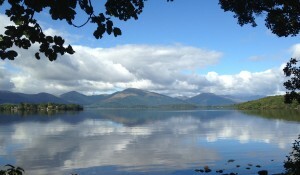 To the sound of the bagpipes I set of on my adventure packed with plenty of water and flapjack as well as a nice sandwich from marks and Spencer’s for the first days walk of 12 miles. I had amazing weather throughout and the scenery was just stunning. The midges were out in force so by the end I looked like a dot to dot but it was exhilarating, hard work and emotional. I really can’t thank CCTA enough for making this challenge a reality. All the support and encouragement from Clare helped me through my training and actually made me believe I could do this and guess what … I did!